Tech lighters feature a large fuel tank, dual jet flame and durable body style that achieve’s XIKAR’s commitment to form, feel and function. The tech lighter combines a sleek transparent body design with solid metal construction at an affordable price. Great for outdoor usage or camping. Tech lighters feature a large fuel tank, single jet flame and durable body style that achieve’s XIKAR’s commitment to form, feel and function. The tech lighter combines a sleek transparent body design with solid metal construction at an affordable price. Great for outdoor usage or camping. Tech lighters feature a large fuel tank, triple jet flame and durable body style that achieve’s XIKAR’s commitment to form, feel and function. The tech lighter combines a sleek transparent body design with solid metal construction at an affordable price. Great for outdoor usage or camping. 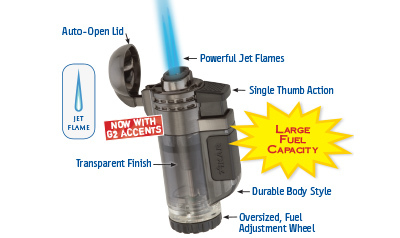 XIKAR is proud to introduce a revolutionary new design in jet flame lighters. The Trezo lighter is the first and only in-line triple jet flame lighter available today. Its unique design places two outer jet flames at an 8 degree angle inwards, concentrating the heat source at the perfect point above the flames. This means that no matter the size of your cigar or lighting condition, you will have a good clean light. First, flip up the top cap and expose the three protected ignition jets. With your thumb, pull down the center trigger to fire up this new lighting system and then enjoy your puros! A large fuel window reminds you to refill the oversize tank and a large fuel adjustment wheel ensures you always have the exact flame size desired.